Fanclub Blogger Template is a free premium blogger template with 2 columns, left wide sidebar and beautiful header. 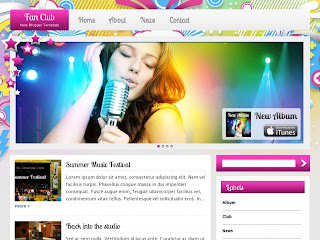 Features: 2 columns, right sidebar, elegant slider menu, box shadow template, search box ready and rounded corners style. Excellent slider feature under header and great colorful designing with Pink is the main color, 4 columns footer with pink colors. Excellent blogger template for Entertainment or Event.